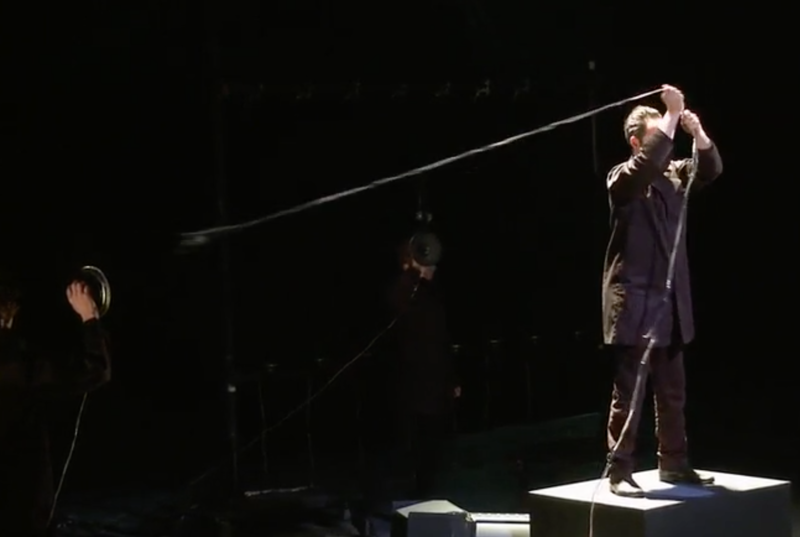 In Transducer (2013), you may easily recognise all kinds of “classical” playing techniques for microphones and loudspeakers, twisted in surprising and clever ways. This results in a performance which reinvents and expands known pieces such as Steve Reich’s Pendulum Music, Karlheinz Stockhausen’s Mikrophonie I or Gordon Monahan’s Speaker Swinging into unexplored territories. 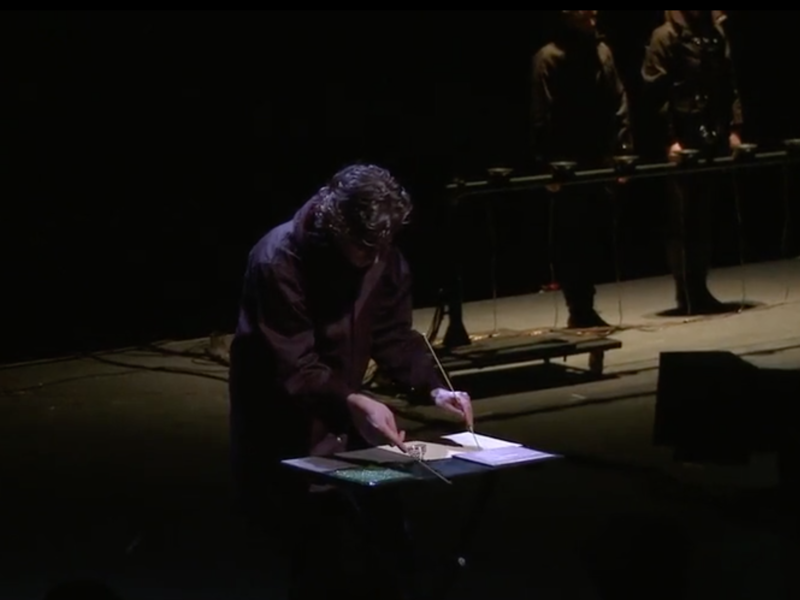 Robin Fox and Eugene Ughetti composed this piece for Speak Percussion (Eugene Ughetti, Matthias Schack-Arnott, Leah Scholes, and guest percussionist Louise Devenish are on stage). One of the main elements on stage is an array of eight microphones hanging above eight small loudspeakers, which is reminiscent of Steve Reich’s Pendulum Music. 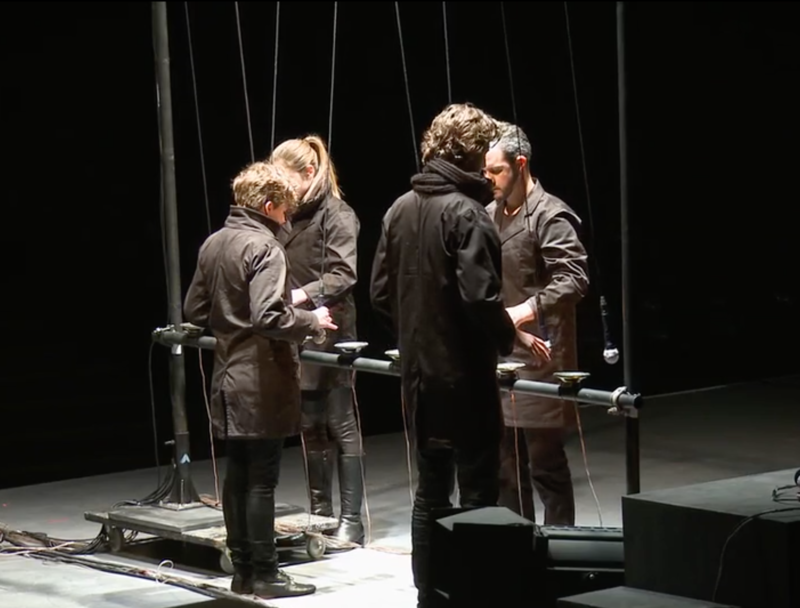 Although clearly inspired by the swinging microphones used by Steve Reich, this pendulum-array—containing more and smaller pendulums—is played in a different way, or more accurately: in many different ways. 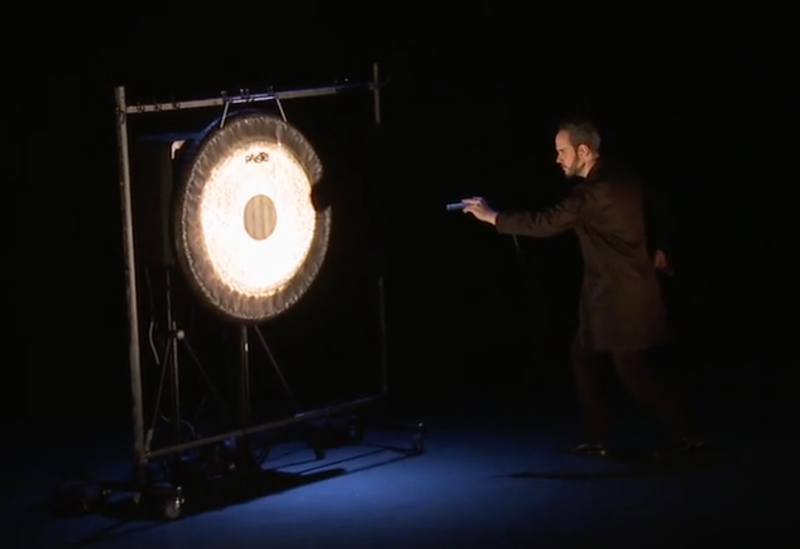 Reich’s Pendulum Music is process-based and acoustic feedback is its sole sound. After releasing the microphones, the performers no longer interfere with the swinging microphones. The performance is finished as soon as the microphones are all hanging stationary above the loudspeakers. In Transducer, Robin and Eugene develop an instrumental set-up with the pendulums, which produce many different sounds, such as clicks, sine waves, or noise. 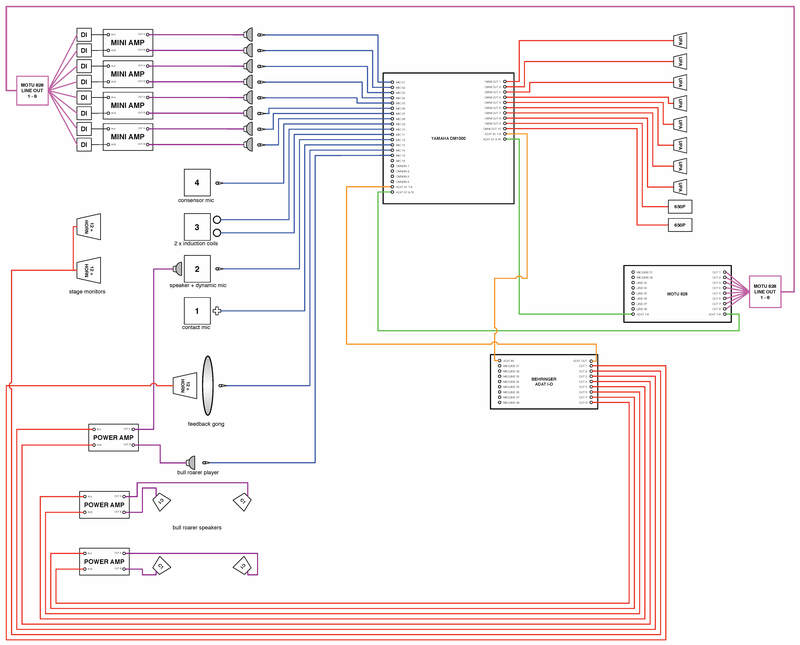 These different types of sounds are generated with the help of patches programmed in the music software Max. The pendulums in Transducer also do not feedback acoustically, but the swinging microphones amplify the sound coming from the loudspeakers underneath them in pulses: the closer the microphone moves to the loudspeaker, the louder the sound becomes. 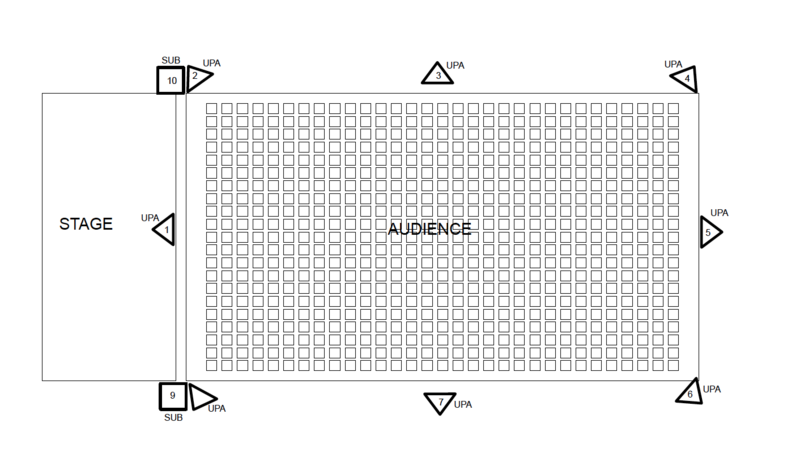 The signals of the microphones can be amplified through eight bigger loudspeakers placed around the audience. The whole set-up for Transducer contains many different kinds of microphones and loudspeakers, and therefore a huge amount of possibilities for combining these. Besides the elements mentioned earlier, there are four different tables, all focusing on a specific topic of playing microphones and loudspeakers. On the Textured Table different surfaces trigger a contact microphone to obtain musical material and have it feeding back through other loudspeakers and microphones. On the Speaker Table, a loudspeaker is placed. 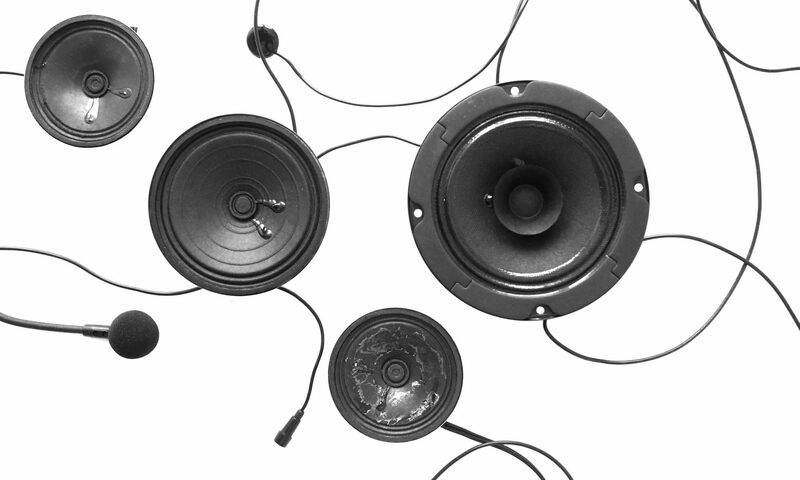 The loudspeaker’s membrane moves other objects (including some ping pong balls! ), and is in fact acting as a percussionist. The third table is the so-called Mic on Mic table, on which a microphone amplifies another microphone, which itself is not amplified. The Electromagnetic Table creates sounds with the use of an induction coil and a pulled-open computer. 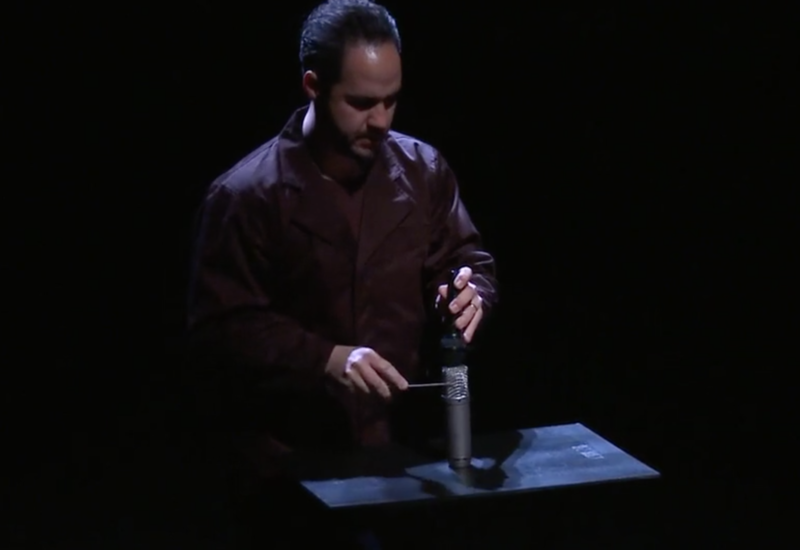 The piece ends with acoustic feedback: Eugene Ughetti approaches two loudspeakers with a microphone. In between them a big tam-tam is placed and starts to resonate according to the frequencies diffused by the loudspeakers placed right behind it. The acoustic feedback is coloured by the resonances of the tam-tam and by moving the microphone close to the tam-tam changes in resonances can be picked up. This might remind you of another well-known composition for microphones as musical instruments. And indeed, the second part of this Speak Percussion concert continues with Mikrophonie I by Karlheinz Stockhausen.